…Martin John, by Anakana Schofield. My observation would be that it was an evenly matched bunch, with no one title rising above the others. We opted to go with the Schofield because both Trevor and Kim said they were happy with it as a choice. If I’m making the book sound a bit oppressive, I don’t mean to. The serious nature of the crimes committed here (none of which, by the way, are ever trivialised) are lightened by humour. 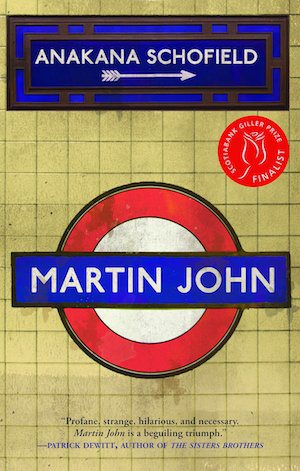 The prose is ripe with witty remarks and ridiculously funny, if absurd, situations, so much so that you can’t help but feel a little empathy for Martin John. Yes, he’s manipulative, yes, he’s a liar, yes, he harms others, but somewhere along the line you realise it could all be stopped if he received the right treatment, for Martin John is not normal. And Trevor had this to say: I wouldn’t mind if this one won, and it battled for the first spot on my own list. On the one hand, it was the most compelling read, and the compulsion to keep reading was helped by the streamlined style as we go through the fragmented thoughts of a sexual offender and those who must associate with him. With that, we turn things over to the Real Jury. They have shown a taste for the experimental in their choices so far — who knows how that will play out next Tuesday.